How to Check If Salmon Is Cooked? The hardest part of cooking a salmon fillet is figuring out how to determine whether the fillet is fully cooked or not. The University of Alaska Fairbanks lists the visual indicator of salmon that no longer looks translucent and becomes a cloudy, pink color as ready to eat. Watch the cooking process closely to prevent overcooking, which results in a dry, tough piece of fish. Wetness in the internal portion of the fillet signifies a juicy piece of salmon, not that the fillet is undercooked. 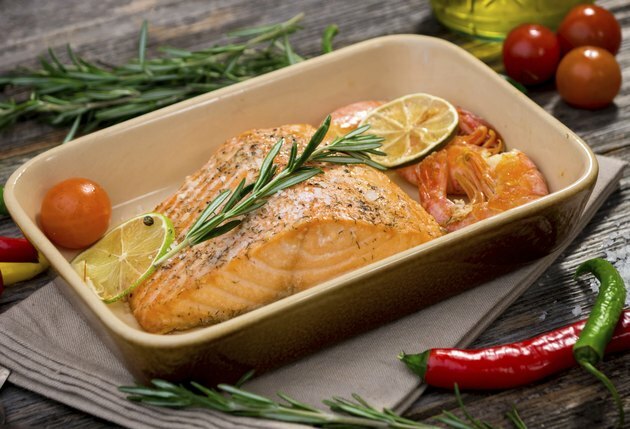 Bake, broil or grill a salmon fillet using your favorite recipe. Place the salmon skin side down to limit sticking and allow for checking the doneness. Cook a 1-inch thick fillet for about eight minutes. Test the thickest part of the fillet two minutes before the end of the estimated cooking time by carefully poking through the fillet with a fork to see if it flakes apart. Uncooked fish has a translucent color and spongy texture. Check the fillet, in one-minute intervals, until the thickest part flakes through the entire thickness when you pierce the fillet with a fork. Pull the fillet apart in a small section, if needed, to determine if the salmon is done. Remove the fillet from the heat immediately, after the doneness test, to prevent overcooking. Always check the salmon for doneness at the thickest part of the fillet to prevent raw areas. Salmon must reach an internal temperature of 145 degrees Fahrenheit to cook completely.